Slip on shoes can be very useful if you’re in a rush, as all that you need to do is quickly slip them on and you won’t have to worry about tying up any laces. Not only this, but some of them can also be used as a very handy pair of shoes around your house. For instance, if you need to do some gardening outside, then some pairs of slip-on shoes will be very ideal for this type of situation. Slip-on shoes are normally used for more casual scenarios rather than formal, so even if you need to quickly pop down to the shops, then these can definitely be used for this. 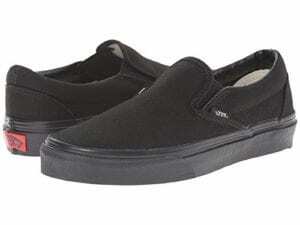 View the Best Slip-on Shoes, Below. How do you lace Shoes so they can Slip-On? How do you keep slip-on Shoes from Slipping Off? How do you wear slip-on Shoes? We’ve put a list together of all of the best slip on shoes across the internet so it can help you decide which ones are best for you. 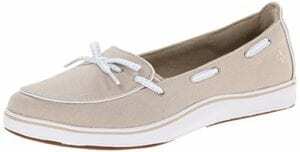 These slip-on shoes are ideal if you need something to wear in the summertime that you can easily put on. They are made from 100% suede, which means that they will last you a very long time because they have been made from top quality materials. They have a very strong rubber sole that will provide you with an additional grip so you won’t ever be slipping over no matter what type of surface you’re walking on. They have a very cushioned insole, which will make it feel as if you’re walking on clouds, plus, they have a flexible outsole too. We liked these slip-on shoes because when we tried them on they were very flexible to walk in, which made walking very easy. 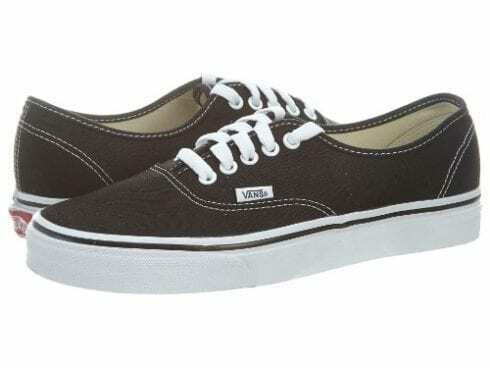 Vans shoes are known to be very reliable, and they produce very sturdy shoes as well. These specific ones are made from leather, which means that they will be able to last you a lot longer than any other material and you can easily wear these in any type of weather condition because they are waterproof. They have a rubber sole, plus, a padded collar and footbed that is able to provide you with extra support when you're walking. They have a shock-absorbing feature, which will prevent your feet from coming to any harm on a daily basis. This product has elasticated sides, which really makes it very easy to slip them on and off of your feet. 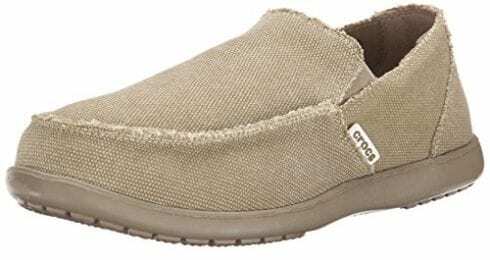 If you’re looking for a pair of slip-on shoes that are a little more formal and that you could possibly get away with wearing to formal/casual events, then these will be perfect for this. These shoes are available in a whole variety of colors so they will be able to suit most of your outfits. They are made from 100% fabric, so it's best not to wear them when it's chucking it down with rain. They have a removable footbed, so if it needs to be washed then you can easily do this, plus, if you want to replace it, then this is very easy too. 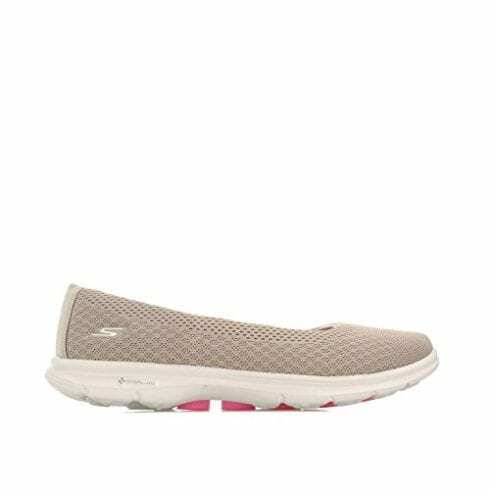 These slip on shoes are so comfortable on your feet, plus, you can purchase them in more than one color. 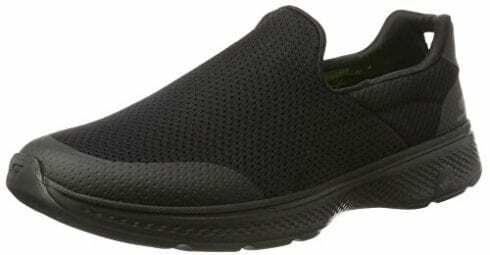 If you want a pair of slip-on shoes that you will be able to wear while you're going out for long walks or a pair of shoes that may also be suitable for a little bit of hiking, then these are made for you. You can also use these shoes for everyday purposes, like going to the shops. They are made from a very sturdy type of fabric that is also waterproof. Not only this, but they have an incredible sole that really provides you with extra grip, meaning they are suitable for long-distance walking, plus, they are slip resistant too. We liked this product because they also have elastic on either side of the shoe, which makes them very easy to slip on and off. These shoes are actually perfect if you want to wear them around the house or if you want to wear them for outdoor use as well. They are made from synthetic materials, which is able to provide you with a lot of comfort. Not only this but the inside of the shoe has a memory foam pillow, which your feet will sink into. These loafers are also available in a whole range of different colors, and they have a lot of grip on the bottom of the shoe that will stop you from ever slipping over. They are also available in a half size so you can get the correct fit for your feet. 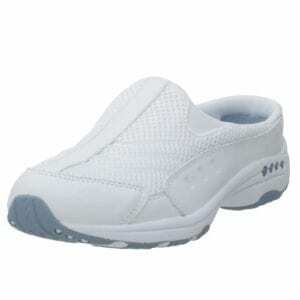 These slip on shoes were so comfortable on your feet, and they will literally adapt to the shape of your feet. 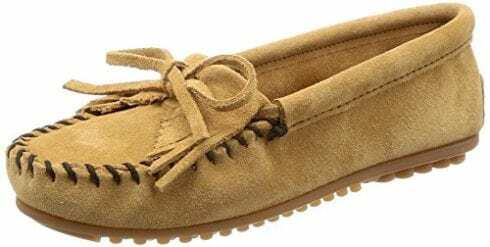 This style of shoe is also perfect for indoor and outdoor use, so if you would rather use these slip-on shoes as a slipper, then you can easily do so. They come in a variety of colors so they will match any outfit. The outside of the slip-on shoes is made from suede, which means that it's very strong and will last you a lifetime. They have a padded insole that is able to provide you with a lot of comfort. They are also very fashionable right now, especially because they have the decorative bow and fringe. These slip on shoes are so trendy to wear and they can be used indoors as well as outdoors. 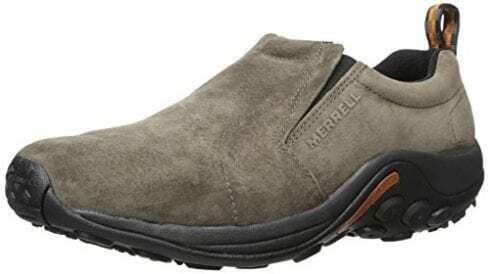 If you're looking for a pair of shoes that are comfortable and suitable for work at the same time, then these are ideal. They are very easy to put on, and if you struggle with this from time to time, then you won't have anything to worry about when you purchase these shoes. They are very lightweight on your feet so you won't feel as if you're wearing heavy shoes that will weigh you down. They are made from synthetic and textile materials, and they also come with a highly responsive 5gen midsole cushioning, which will provide you with a lot of comfort. These slip on shoes are available in a whole range of colors that you can purchase, which means they will suit any of your outfits. These slip-on shoes are perfect for the summertime, and they will look outstanding with one of your summer frocks. They are very easy to slip on and off, and you can pretty much do this instantly with no effort whatsoever. They are very lightweight on your feet so you won't feel weighed down when you wear them. Not only this, but the material that they are made from means that you’re feet will also be able to breathe easily, and it will stop you from having an odor on your feet and in your shoes. This product is so easy to slip on and they have such a strong grip on the rubber sole that will stop you from slipping over. These sneakers are a classic slip-on shoe that can be worn to any casual event that you may have, plus, they are also very suitable if you need to wear them to the shops as well. There are so many colors and patterns that you’re able to choose from with this shoe. Not only this, but they are made from vegan canvas, which means that no animals were harmed in the process of making these. The inside of the shoe is also made from the same canvas too, so you’re mind will be at rest that no animals were involved with the making of these shoes. These slip on shoes were so comfortable and lightweight on your feet, plus, the vegan canvas is a bonus. These slip-on shoes are definitely a classic type of shoe that most men own, and if they don't then, they need to purchase a pair. These specific ones are actually hand sewn, which means that they are a very durable type of shoe. Plus, they have a cushioned footbed that will provide you with all-day comfort. They have an EVA heel cup that is able to enhance shock absorption, and it will also provide you with all of the additional comfort that you need. They are also available in a large variety of different natural colors. These are a great slip on shoe that have been very well hand sewn and they are extremely reliable and durable. There is a whole variety of different slip-on shoes in the list above, and some of them are more suitable for men while others are more suitable for women, you can also purchase a unisex slip-on shoes as well. There can be quite a big dilemma over which shoes you should purchase because there are so many different styles. One thing that you will need to know though is what type of weather condition you would like to wear them in, because some may not be suitable for wet weather conditions. Therefore we’ve discussed some of the things that you need to look out for before you purchase a slip on shoe. You would have noticed that there are completely different styles and designs of slip-on shoes in the list above. Some of the slip-on shoes you can simply just place your feet in, whereas others might have elastic on either side of the shoe, and some may even have some very short laces. All of these shoes will slip on the same, but if you’re looking for a pair of slip-on shoes that you can get on without having to bend down, then the elastic ones might not be ideal for you, as they can take a little bit more effort to put on. However, the other types of shoes will be just fine even the lace up ones shouldn’t require that much effort because the laces will be so low down. This is another very important factor that you need to look out for, as the outside material will indicate what type of weather scenarios the shoe is suitable for. For instance, if they are made out of fabric or suede, it’s unlikely that they will be waterproof and you don’t want to get caught in the rain with your brand new slip on shoes and get your feet wet. Another thing you should see is if the material is breathable, as this will prevent any moisture from forming in your shoes, meaning that your feet or shoes won’t have any odors. Plus, it is also able to prevent athlete’s feet from forming. The material that the slip-on shoe is made from on the inside will instantly tell you exactly how comfortable they are. The type of material that you ideally want your slip-on shoe to have will be memory foam or a kind of EVA insole. This is because these are so comfortable on your feet when you’re walking. Not only this, but it also means that it will allow the shoes to mold to the exact shape of your feet. Therefore you’re feet won’t be able to rub like it may on an ordinary shoe and cause blisters because they will be an exact personal fit. Ideally, you will want the sole to be made from rubber or gum rubber. This is because this type of material will be able to provide you with the best grip and it will stop your shoes from ever slipping on the ground. Some of the shoes in the list above may also have a slip resistance feature, and this is a really great feature to have, as it means that you won’t be able to slip over in them when you walk on any type of surface. Some slip on shoes do actually come with laces, and there are certain ways that you should tie them in order for you to be able to slip them onto your feet easily. One thing that you must make sure that you do though is to tie them very loosely, because if you tie them too tight when they are not on your feet, then you will definitely struggle to put them on. There is also a certain technique that you can use in order for your laced shoes to become slip-on shoes. First of all, you will need some lace anchors to be able to keep the laces in place. To start with you will need to simply put one of the laces in the very first hole at the bottom and then thread it through to the hole that is diagonal from it. Then repeat the process with the other lace too and keep on threading the laces through the holes diagonally until they reach the top of the shoe. Make sure you’ve attached the lace anchors in place to make sure that they stay there and then you will have a pair of slip on shoes. This is a very important question about slip on shoes. 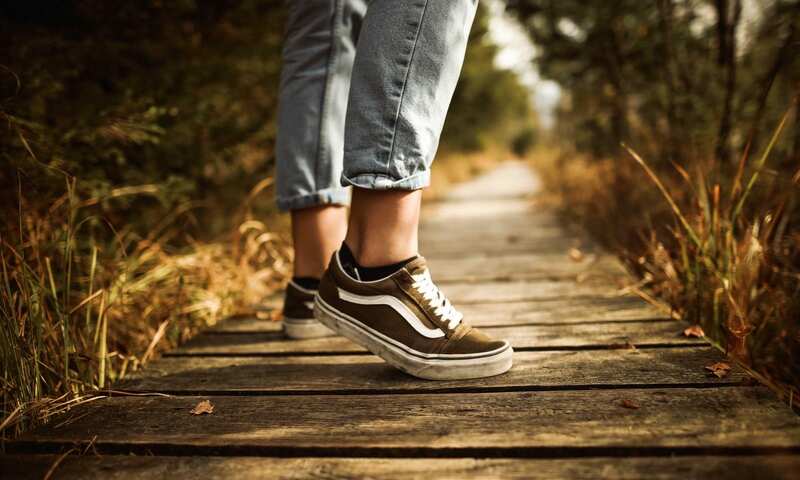 Because there are no laces on the shoes, it means that they are more likely to be able to slip off more easily, but there are ways that you can prevent this from happening to you. First of all, you will need to make sure that the slip-on shoe fits you correctly, because even if they are a little bit big, then they will more than likely start to slip off. Even if they are still doing this there are several things that you can try, for instance, you can try putting non-slip insoles into the shoe, spray your feet with hairspray, put deodorant on your feet or use double-sided sticky tape. Some of these may sound a little bit bizarre but trust us they really do work like a treat. You would usually wear jeans and a top with these styles of shoes. However, if they are slip on ballerina flats, then these could be worn to more formal places, and if you wear them in the summertime, then they may even suit some of your summer dresses. If you’re planning on converting your lace-up shoes to slip on shoes, then it’s important that you re-do the laces a couple of times in the year. This is because the laces may adjust a bit after you’ve worn the shoes several times. Slip on shoes first originated from Turkey, and they were called Yemeni shoes. They were also handmade, and there were also a variety of colors to pick from. We hope you enjoyed our article on "10 Best Slip-On Shoes in 2019", if so, please share and rate it.